You just bought a new house and need to move out of your small apartment , but the house is still being built? 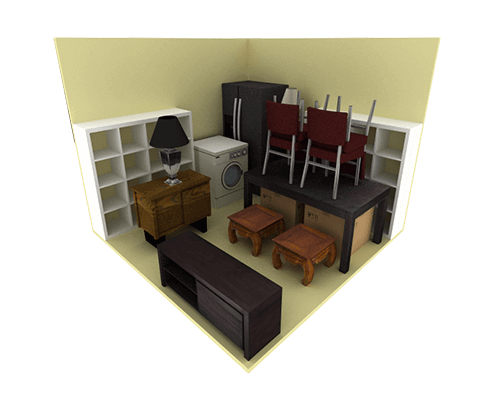 This 80 square foot unit should hold all your items! It is ideal for storing an entire living room and two full bedrooms. Not sure what size you need? Check out our Unit Sizes Estimator. Are You Looking For A Good Self Storage Place? Not all storage companies are created equal: our self storage facilities offer affordable services including: climate controlled storage, vehicle storage spaces, boat storage buildings, cardboard moving and storage boxes for shipping, and moving supplies to help you move or relocate your home, office, room, garage, or shed. Whether you're downsizing, moving, or just decluttering, the storage professionals at Ajo-Kinney Super Storage can help you decide which self storage unit size will work best for your needs. You Need Insurance. Find Out Why.